In this next part of the Flash AS3 Event Handling tutorial series, we're going take a look at how to write event handling code. According to the Adobe Flash ActionScript 3 documentation, there are 3 important elements that need to be identified when working with event handling in Flash. These are: (1) the event, (2) the response, and (3) the event source. We've already introduced the concepts of events and responses in the first part of this lesson, but let's go ahead and take a look at them again with a little more detail. And then after that, let's take a look at what the event source is. An event refers to a specific occurrence that happens as your Flash movie runs. In ActionScript 3 event handling, events are identified by specifying the event class as well as the event constant. Event classes can be thought of as the different groups used to classify different kinds of events. There's an event class, which is also called Event. Some events that fall under this class are the complete, deactivate, and open events. Another example is the keyboard event class, which is written as KeyboardEvent. Some events that fall under this class are the key down (i.e. when the user presses a keyboard key) and key up (i.e. when a key is released) events. 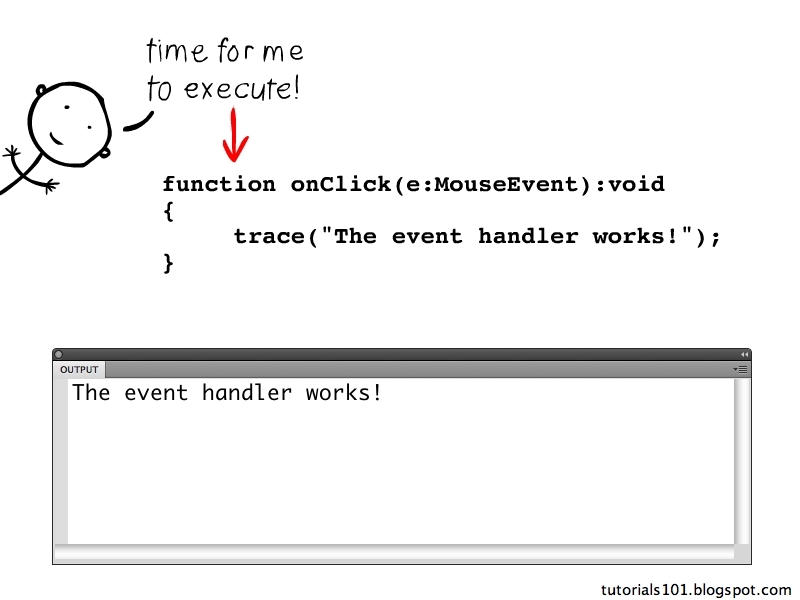 There's also another class for mouse events, which is written as MouseEvent. Event constants are specific names that refer to the events themselves. Let's consider the MouseEvent class, a few of the events that fall under this class are: mouse clicks and mouse roll overs (i.e. when the cursor hovers over a button). 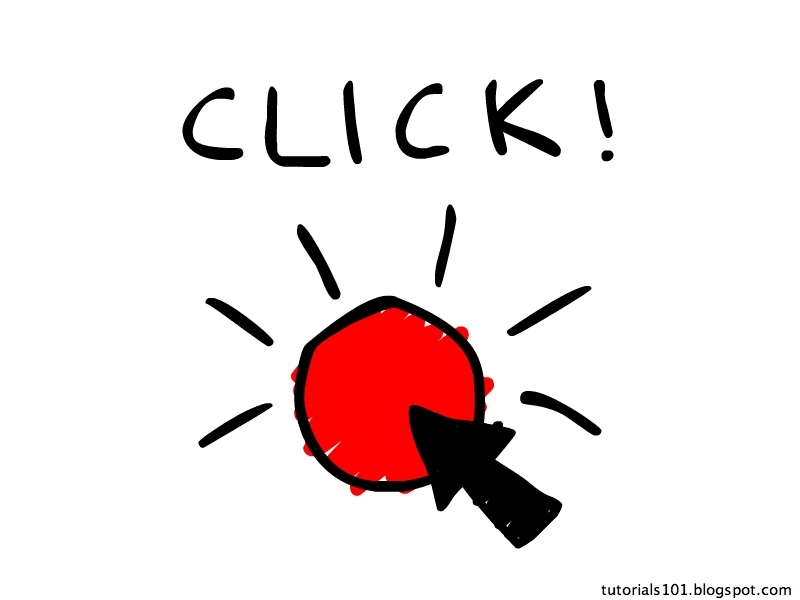 The constant for a mouse click is written as CLICK. For a mouse roll over, it is written as ROLL_OVER. 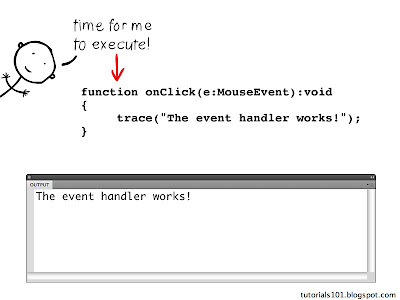 So for example, if you were to specify a mouse click event then you would write: MouseEvent.CLICK. And if you were to specify a mouse roll over event, then you would write: MouseEvent.ROLL_OVER. A response refers to what is going to happen once Flash detects the occurrence of an event. For example, after a button is clicked (MouseEvent.CLICK), we can instruct the Flash movie to respond by playing an audio file. The response is specified as a function. This function's body will contain the line(s) of code that will tell Flash what to do. This function, referred to as an event listener (also sometimes referred to as an event listener function or listener function), will be called immediately after the specified event is dispatched and detected. 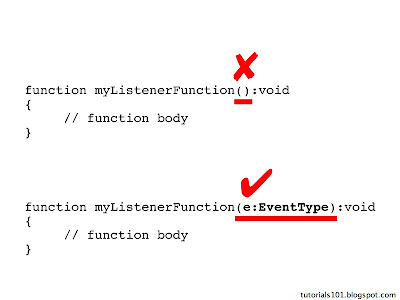 REMINDER: The terms event listener, event listener function and listener function all refer to the same thing - it is a function that is registered to execute when a specific event occurs. An event source refers to the object that is directly related to the event. In most cases, it is the object from which the event originates from. 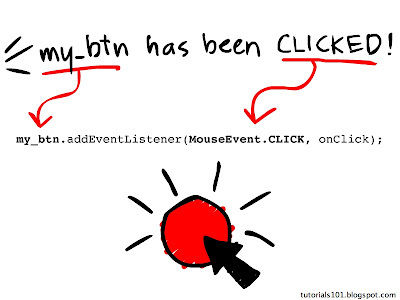 For example, when dealing with mouse click events, the button that was clicked would be the object that the mouse click happens to, and is therefore considered as the event source. Another example would be when a URLLoader object loads an external text file. For instance, when a URLLoader finishes loading the file, this is considered as an event as well. In this case, the URLLoader is the one responsible for loading the external text file and is therefore considered as the event source. This event source can also be alternatively referred to as the event target. After identifying these 3 elements, you bring them all together using the addEventListener() method. 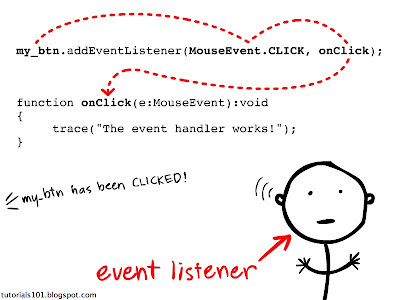 The addEventListener() method registers the event listener function with the event source so that the event listener function can "hear" when the event is announced. This is essentially what connects the event listener function to the event. 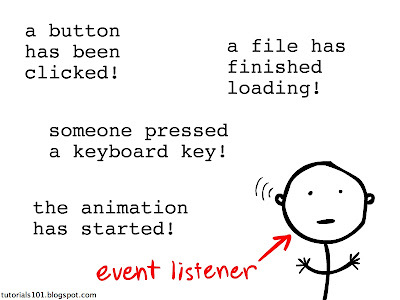 Once an event listener function is registered with an event source, you can think of it as the event listener function sitting there quietly, just waiting to be told or "listening" for when the event is dispatched or announced. Once the event is announced, the event listener function will then run, enabling the Flash movie to make the appropriate response. 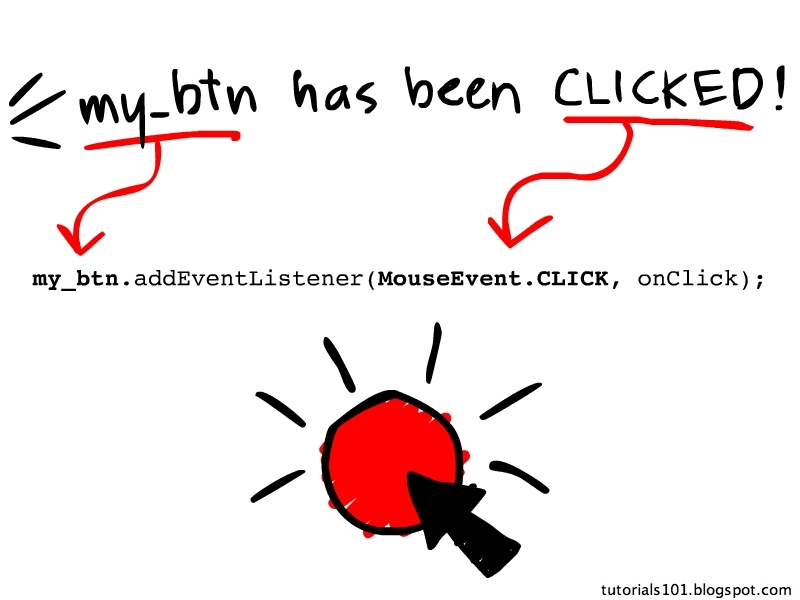 You've just written some code that handles a mouse click event. Go ahead and test your movie. When you click on the button, you should see the phrase The event handler works! come out in the output window. We've learned that there are 3 important elements when it comes to working with event handling in Flash AS3 (the event, the response, and the event source). But when it comes to writing the event handling code, the code itself is made up of 2 parts: (1) the add event listener statement, and (2) the event listener function. Whenever an ActionScript 3 event happens, the event gets dispatched or announced within the Flash player. 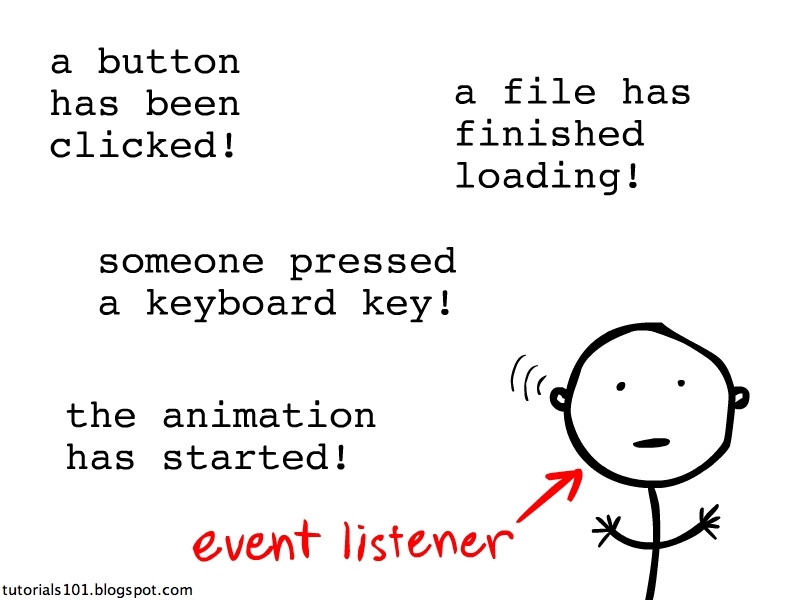 Once the event is announced, the event listener function that is registered with the event's source will execute. To register an event listener function with an event source, the addEventListener() method is used. Registering the event listener function with the event source will enable the event listener function to know when to respond. The event listener knows that it is the function that needs to be executed because its name matches the event listener function name that was specified in the add event listener statement. NOTE: You will also notice that the event listener function has a single parameter - e. We'll talk about that later. So that is the basic flow of how events in AS3 are handled: (1) the event occurs, (2) it gets dispatched, (3) the event listener "hears" the event being dispatched, (4) and the event listener function runs. Now let's go back to the event listener function and lets talk about the single parameter that it is set to accept. In our example, the parameter is named e and is of the MouseEvent data type. Every time a dispatched event triggers an event listener function to run, information gets passed to that event listener function. This information is contained in what is referred to as an event object. This parameter is what is used to accept that event object whenever it gets passed to the event listener function. Some of the information contained in this event object include: the event source and the event that occurred. All event listener functions must always have a parameter for the event object regardless of whether or not the parameter will be used anywhere in the function body. In our example, we do not make use of the event object parameter, but if we removed that parameter, our event handler code will NOT work. In the examples, the parameter name used is e. It's NOT a requirement that you use the name e, since parameter names are author defined. The usage of e is more of a common convention, and is what will be used throughout this tutorial series. In the next part of this series on Flash AS3 event handling, we are going to take a closer look at the AS3 event object. Really nicely done! I have been reading and watching tutorials on Actionscript 3.0 and this is very informative. Thank You! Well structured and written - really enjoyed learning AS3. Your tutorials are engaging, relevant and useful. Many thanks. Very nice tutorials for begiers like me to start with...each and every aspect is explained in detail and simple language..
All I can say is FANTASTIC! Within 1 hour I had understood the events, listening and functions CLEARLY! It took me back to the days of Adobe Photoshop and the 'Photoshop Bible' book. Written in a language that 'normal' people understand. Me too! First time I find something so valuable, thanks a million! i was gonna say the same .. this is valuable .. u should be on google ranking #1.
can u please tell me how do i fix that ?? This may be late but I had the same issue, if you drew a shape as just an outline, without coloring it in, you will need to click the lines of the outline, not on the inside. Took me lots of angry clicking to randomly stumble of that haha.